Just wanted to share with you all some of my families favorite board games of all time. 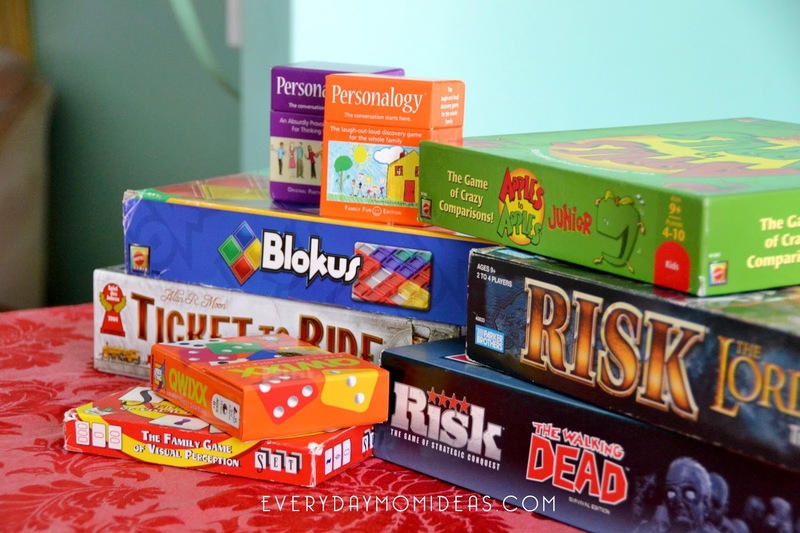 We have over 50 beloved family board games in our home and it was hard to narrow them down to just our top 10. These are actual board games we have used and loved over the years and some of our more recent favorites we have discovered. We love to play board games as a family and try to play at least once a week. 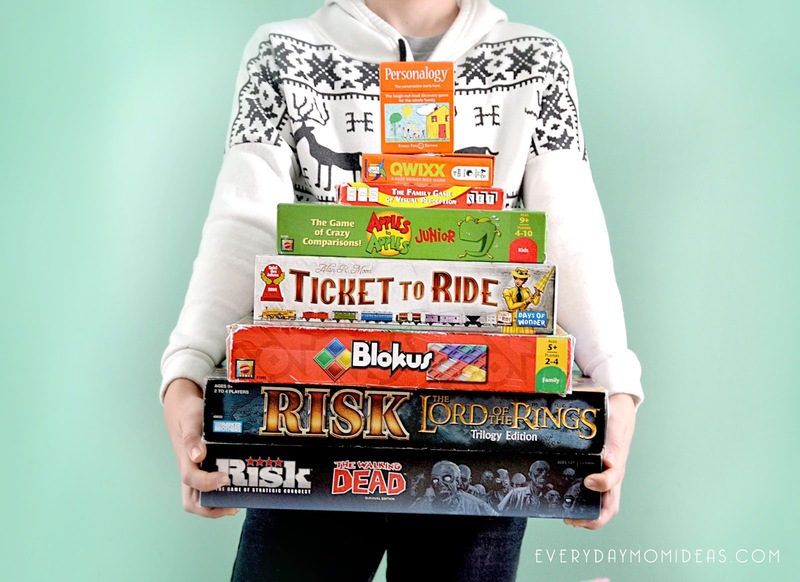 We have a lot of great board games and card games but these are the ones that get the most play out of them, so definitely worth the investment. Most of these games are for eight years old and up and the best part is the parents will love playing them too. Description: A social card game for three to 10 players. Place down the best card you have in your hand that best fits the description the cardplayer is holding. The twist is that you have to put down a card you think the cardholder should pick. The cardholder can pick any card for any reason they seem fit. How well do you know the card players personality and sense of humor? Average Time: 15 to 60 minutes, you decide. Why we love it: It's a light-hearted casual game that a large number of people can play. It helps you get to know each other in a not too invasive way or by making clowns of ourselves. It's laid back and funny. 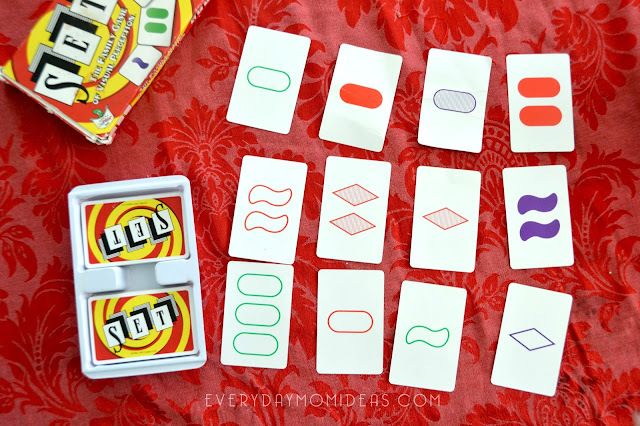 We love playing the Jr. addition with our older boys because the themes and topics of the card are perfect for them and we enjoy playing it as well. Description: A hands-on game for four players. Each player has a set of blocks in different shapes and number of blocks. Each player puts down one of the blocks in their stash. The board starts to get crowded as the game moves forward and you have to come up with creative ways to place your shapes before you get cut off. The player to put down the most blocks wins. Why we love it: The blocks are kind of pretty and I love how you get to use your hands to create these beautiful patterns on the board. There is some strategy and style involved but it is still casual and light. You could probably play this game with your child who is as young as five years old and you would still enjoy it as an adult. When we play this game we usually play it twice in a row because it's so fun and easy but challenges the mind. Description: A race to get as many of your trains on the track before the first player runs out of trains. Get points for the most trains on board, most destinations accomplished and longest connecting train rout. Average Playing Time: Depending on the number of players. We play all five and it takes about 90 minutes. Fewer players = Shorter Game. Why we love it: It's not a complicated game, easy to play and it's still competitive. 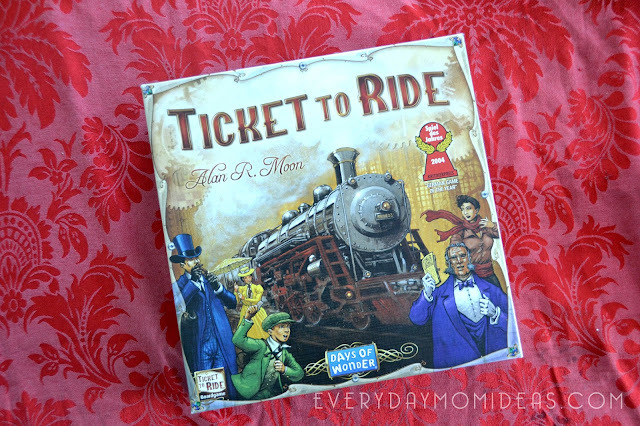 You can feel the excitement and energy to get your trains on the board before the other players take your rout that you have been gearing up for. Love the beautiful map and details of this game and love that we can play this with our kids seven and up. Also, we like that we can play up to five players. Description: A fun strategy game for three to four players, you can buy an expansion pack to get up to eight players perfect for bigger families to all join in on. Place houses and roads to build your settlement by collecting resource cards. The more resources cards you get by rolling the dice the faster you can put down and build your settlement. There are different ways to earn points, the first person to reach 10 points wins. Average Playing Time: 90 Minutes. It gets faster the more you play. Why we love it: This nonviolent strategy game feels like an adventure/settlers type of game. We like feeling a little immersed in the game/world. This is slightly more complicated to learn but so worth the effort because you can get more involved in the game than with other games. We also like that there are different ways and styles to go about winning the game or each time you play this game it feels a little bit different. Description: An easy to learn strategy game for two to four players. Collect cards/jewels in order to collect bigger jewels with point values attached to them. There are different strategies for gaining more jewels and points. The first player with 15 points wins. Why we love it: We have played this several times with friends and have been wanting to get this game so bad. We finally bit the bullet and sent a letter to Santa Clause to tell him to get this for us this year. So here is hoping that this will be the latest game added to our collection. This game is one of those game that gets picked and played a lot because you have that feeling during the whole game that you just might win, your so close. Rematch! It can be a tight race to the 15 points or someone will surprise sneak attack you with a ton of point and win. The game can go either way so it feels fresh every time. Description: Race to match the cards laid out on the table into different kinds of categories and "sets". The first person to see a set yells "SET!" and gets the set of three cards. Play until no more cards can be matched. The player with most sets win. Simple! Why we love it: The more we play it the better we get at seeing the sets, so it kind of feels like a mental exercise but it is still fun to play if you are rusty. 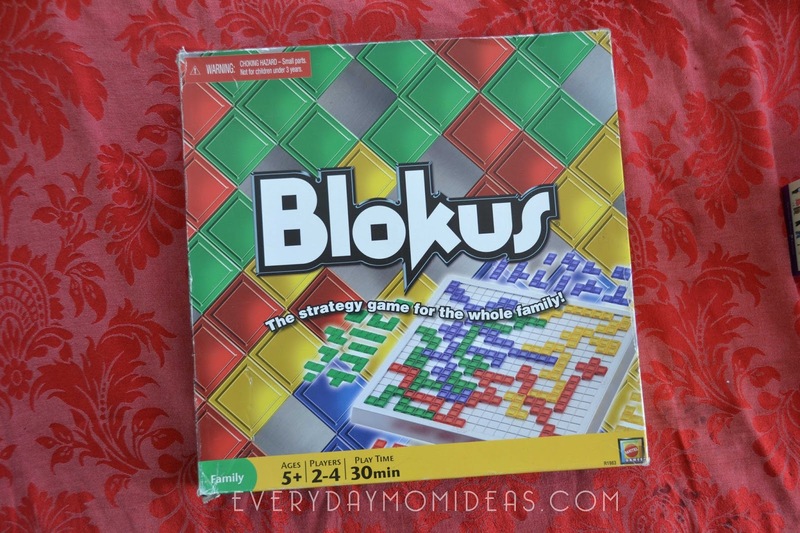 This is a casual game that the whole family can play but it also gets your heart racing as you frantically look around for sets. I also like that this game is always full of laughter. Description: 2 to 6 players, Roll the dice to check off a number on your scorecard sheet. There are four rows of numbers from one to 12 and 12 to one. As you check of numbers you lock the numbers to the left off and you can no longer use them. 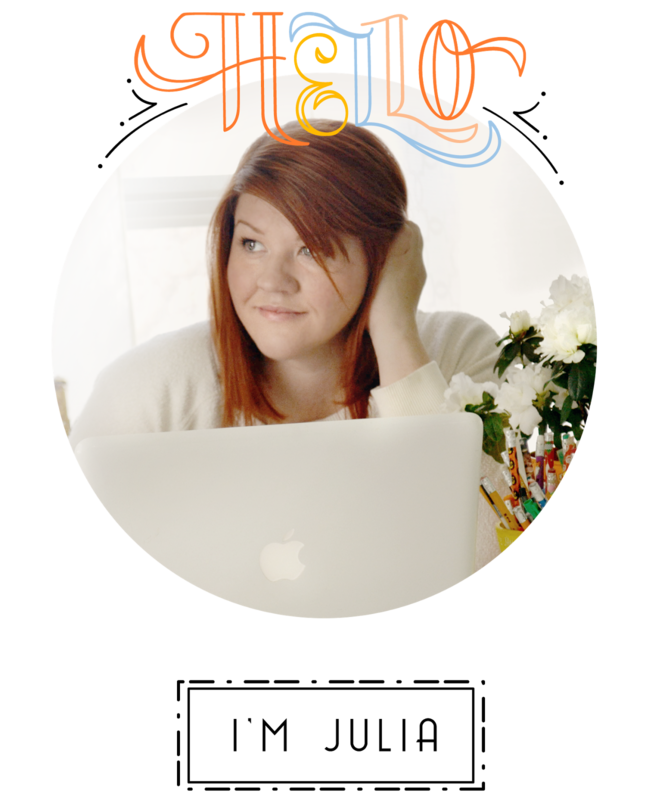 The strategy comes from deciding if you want to take the risk to mark off that number or wait for the next roll. Who knows you may get lucky and get the number you need. Players with most numbers checked off wins. Why we love it: It's a casual go-to game that we pick a lot. Easy to get the hang of. Its part chance game with a little strategy and style needed. Anyone can be good at this game, you don't have to be seasoned in the gameplaying to be good at it. Description: A get to know you card game, perfect for the dinner table and long family car rides. One person picks a card. 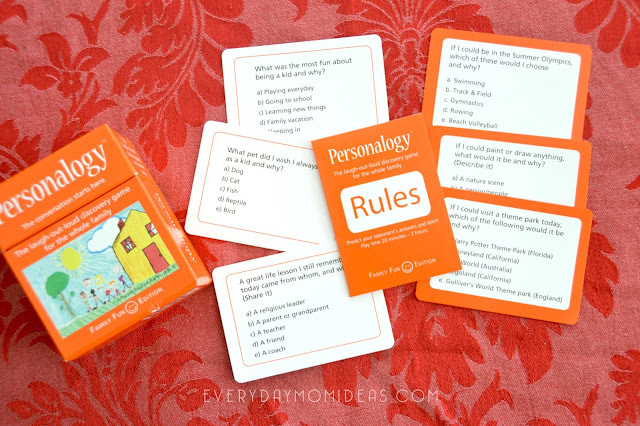 The card is a question about themselves that everyone has to answer via multiple choice. Then everyone has to explain their answer to the cardholder. How well do you know the card holder? Once everyone has answered and given their "why" the card holder answeres the question about themselves and also gives a why. The closest answer wins. You can play for points or play for fun. Why we love it: This is more of an icebreaker/conversation starter type of a game. There are ways to play for points but it is just fun to play around the table. 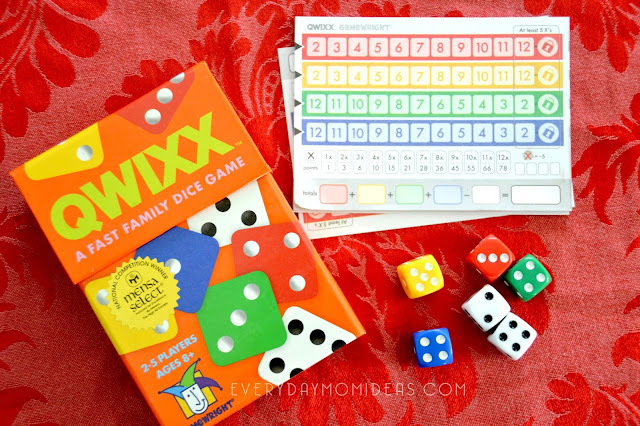 We really like the Kids version of this game because is geared toward parents and kids getting to know each other. There are "Parents" cards in the deck just for the parents to pick from. The questions are based on what life was like when the parents were kids. Its very fun and thoughtful game. And we learn things that we didn't think to ask. There is also a grown-ups version that is perfect for date nights and can just be played between a couple or add in friends for extra fun. Description: This can be a very intense game and takes a long time to play. Emotions run high as you try to dominate the board and take over the world one dice battle at a time. Great for kids nine and up but parents might have to take it a little easy on your kids. Why we love it: Perfect game for if you are in the mood to get into a real experience. It's not just a game but an event. Every gameplay is an adventure that your family will remember instead of a casual game you will forget by the next day, this is one that is talked about and remembered for years to come. 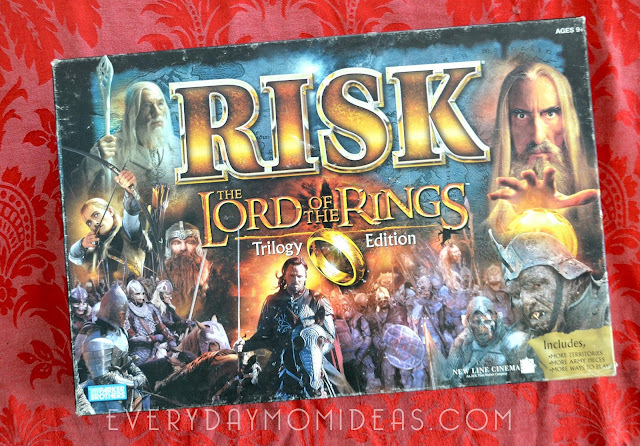 We love the Lord of the Rings version best because the "ring" moves around the board so the game is not as long and there are a few added rules that make it more fun and relatable to one of our favorite movies. The Walking Dead is also a favorite version because you can have five players in this version instead of four, but the zombies are vicious. Also, another amazing version is 2210 A.D. it has a little bit different gameplay and you can use the use of the moon which is pretty fun. Description: A fast-paced card game on a round phase 10 board for two to five players. Draw and collect the cards you need in the specific phase you are on. If you complete the phase in a turn you get to move on to the next phase. First to complete phase 10 wins. The twist makes an added element to the classic game so that now you can skip phases or move back a phase depending on how the dice rolls. Why we love it: I never really like Phase 10 because I thought it was too long and not enough action the Twist totally amps everything up and now I love to play phase 10 Twist style. It goes by faster and can be very unpredictable depending on where and how you land. I tried to give you a well-rounded selection. It's always fun to have an array of different games to play as a family. Sometimes a long adventure strategy game like Risk is in order and other times you just want a quick filler game that is chill to lift the mood and atmosphere. I hope to be adding to this list in the future because we are always on the lookout for awesome games that we can play over and over again. Keep a lookout for my next Top Game List! This one will be for fun games to play with your little kids. Please share this game guide with your friends and family on Pinterest.